An abacus is a very old tool used for math. It is still used in some parts of the world. Sometimes blind people will use an abacus, because they can feel the numbers easily. The most common abacuses work by moving beads on rods. Abacuses can do addition, subtraction, multiplication, division, and people can use them to find the square root of whole numbers. Expert, or very good, abacus users can sometimes do math quicker than basic calculators. There is a common Chinese abacus. This abacus is split into two kinds of basic rows, the top is for the "5"s, and the bottom is for the "ones". There are one or two beads in the top rows, and four or five beads in the bottom ones. For example, 8 is one bead on top and 3 below, because 5 + 3 = 8. Every column represents a different digit. The Abacus is really useful for math and is really fun to mess around with and just have fun with. Good to get for young children as toys or to help them learn. Wikisource has the text of the 1911 Encyclopædia Britannica article Abacus. 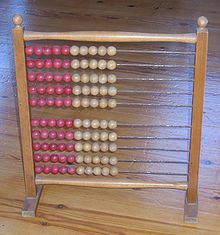 Wikimedia Commons has media related to Abacus. This page was last changed on 5 March 2018, at 14:19.